He was always doomed to fail. Christian Hackenberg, a young kid with a million dollar smile and a multi-million dollar arm coming to campus with the weight of the world on his shoulders. He and Bill O'Brien working hand in hand to rebuild a crippled Penn State program and set it on a course to restore it to so-called glory. All in four years, and if things went well in fewer than that. To a certain extent that has happened. Penn State is recruiting as well as it ever has if not better albeit under James Franklin. The talent is coming in and it's bringing in more talent. But Christian Hackenberg is a martyr for the cause. The program finds itself in an ambiguous position somewhere between legitimate offensive issues and the fallout of a sanction era. Everyone deciding on the fly if any given drive is the result of mismanaged assets or simply the fact the assets aren't good enough yet for consistent play. Until Penn State has a benchmark season after the sanctions, it will forever be battle to find the line between bad play and bad circumstance. So as Penn State struggles, fans look to the one thing that is easiest to understand: Hackenberg, a quarterback whose alleged status as a No. 1 overall pick paints him the savior of the cause. Fans put their belief in him. You can point to that projection and say "Why aren't you better? Why have you not lived up to ever ounce of the hype?" There is some truth to those shouts. Hackenberg has not been perfect and his issues at times have hurt Penn State. His throws are not always on target and his decisions have cost the Nittany Lions in previous seasons. Penn State's seasons under sanctions were rocketing towards an epic collapse. Everything was working against the Nittany Lions and yet each season was a winning one. Each year Penn State came out on top despite insurmountable odds. So has he not delivered? Perhaps more importantly, do fans see someone else on the roster that was going to do better? If not for Hackenberg it may have been Steven Bench, a quarterback who was most well known for taking photos of his dogs wearing motivational signs. He would have taken over the reigns for a short time. If not Bench then maybe the talented but unproven duo of Michael O'Connor or Tyler Ferguson. Do any of those options sound like the difference between winning and any given loss under Hackenberg? Maybe they would have. It's possible that as Hackenberg becomes a square peg in a round hole that while not as talented, Bench or O'Connor or Ferguson would have brought something else to the table. Something that may have worked better in James Franklin's offense. But would it have really changed the big picture? When you look at the past three seasons and the one going on right now, not one is a season of "what if?" Not one started with promise of big national ambitions. Penn State has spent the better part of a half decade trying not to collapse into a pile of irrelevant football players playing for an irrelevant team. It's that so frequently forgotten fact that makes the quickly approaching end of Christian Hackenberg's collegiate career a sad ending. Held to the highest expectations possible Hackenberg did not deliver. He could not save the Nittany Lions every week, he couldn't throw every pass and he frequently made unforced errors. He never was going to be the perfection fans demanded. And yet he walks out and speaks to the media after nearly every game, far more than his offensive coordinator ever has, and answers questions with a smile. He has yet to complain in public, he has yet to break from program message. He has done everything anyone has ever asked of him and probably more. More often than not he has played well in spite of those overwhelming odds. And twice given the chance to take the easier road, he stayed. All of this has slowly turned the probable last days of Hackenberg's career into something that lacks any thankful celebration. For the most vocal of fans online he is no longer wanted, calls for his benching are more common than the calls for one more year. If and when he leaves, Hackenberg will do so in the cold of winter with no senior day to have as his own, no one final jog down the tunnel as his name is called and fans cheer for him one more time. Less than 100 yards from the all-time passing mark it will be a complex and disappointing legacy that he leaves behind for fans who want to believe that Penn State can win a national title every year. In a moment of twisted fate, Christian Hackenberg has gotten Penn State back to a point where fans have the luxury of complaining about Christian Hackenberg's play. That itself a sign his tenure has not been a failure. Truly, at the end of the day Penn State and Hackenberg may both be better off in the long run without each other. But it's ludicrous to say Penn State is not in better shape because of him. And if he only takes the Beaver Stadium field twice more in his career, it would be a shame if fans forgot that. 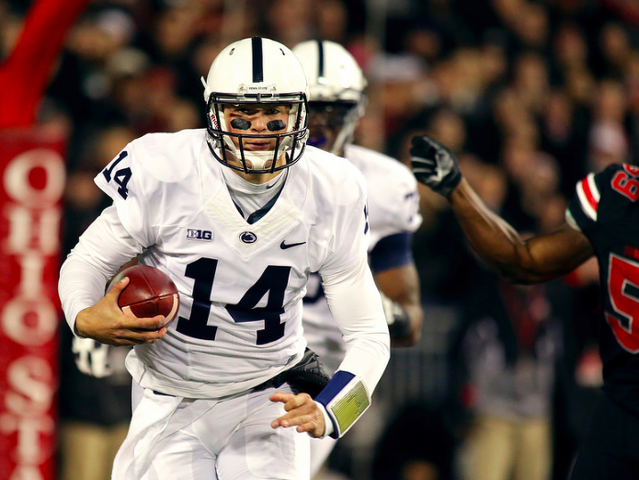 Hackenberg's legacy is complicated because life is complicated, but it doesn't have to be. He helped save Penn State football. There's a strange sight today in State College. The local Veterans of Foreign Wars post isn't flying some of its usual flags. But the empty flagpoles aren't due to a lack of patriotism or support for the military. 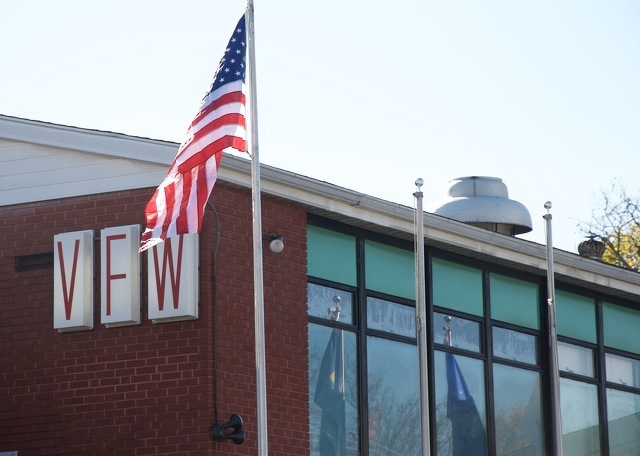 The flagpoles are bare because someone stole the banners that typically fly above VFW Post 321 on Barnard Street.